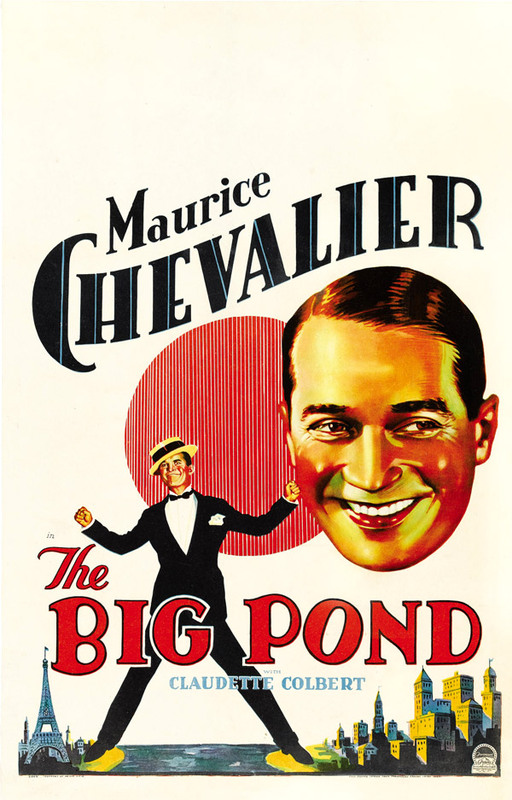 The Big Pond is one of those super-rare early talkies from Paramount. I finally broke down and paid for a copy (along with a few other rare films I'll be posting about in the coming weeks). This has good sound but a washed out picture that looked as if it originated as an 8mm transfer to a thirty-year-old VHS. Nevertheless, it was happily watchable — and what a great poster! 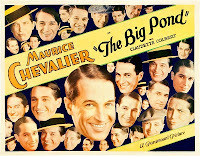 Frenchman Maurice Chevalier plays Pierre, a tour guide in Venice who falls head over heels for chewing gum heiress Barbara Billings (Claudette Colbert). Her father is naturally against the pairing, so he schemes to bring the young man back to the states and puts him to work in the chewing gum factory, thinking the dapper continental will fold like taffy under the strain of real work. Pierre thrives instead, and in due time manages to become the son Mr. Billings never had. However, as he rises in the gum business, he craps out with the girl. He wants to succeed in business, while she craves the romance they shared in Italy. All’s well that ends well though, and even in 1930 Hollywood knew how to neatly package a romantic comedy. For those of you (like me) who can only take Maurice Chevalier in small, infrequent doses, this is a pleasant surprise. There are a few modest musical numbers, fairly catchy, and the whole thing is so innocuous it’s hard to dislike. 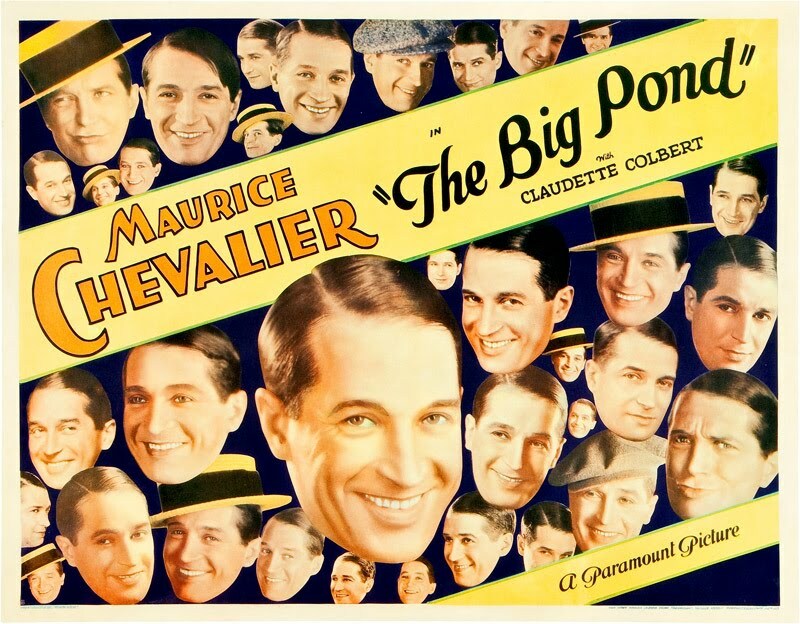 One interesting notion is that by 1930 when this was made the U.S. was in the throes of the depression, yet The Big Pond lacks much of the ostentatious, audience-pleasing glamour that would characterize the rags to riches comedies of the mid-thirties. Sure, Colbert is bejeweled in every scene, but the sets haven’t yet taken on the glimmering art deco trappings that would soon take over studio productions, and the script clearly focuses clearly on the value of hard work rather than the zany eccentricities of the wealthy. The Big Pond even takes its shots at the Volstead Act: Pierre finally scores with Mr. Billings when he develops a new line of liquor-flavored chewing gums: scotch, rye, bourbon … and champagne. In only her fifth film, Claudette Colbert’s mature screen persona is solidly in place, and that unmistakable voice cut through the haziness of my poor copy like something soothingly familiar. Her role is smaller than I’d like, but the performance is exactly as you’d expect: competent, charming, and professional. Her on-screen father, played by first-timer George Barbier, manages to steal the show. Barbier is a delight as the chewing gum king, with a deft comic tough — his chemistry is as good with Chevalier as it is with Colbert. This was Barbier’s first film, though from 1931 to 1936 he would make a rather astonishing fifty more! What a day it will be when Universal, which owns the rights to The Big Pond, and as many as 700 other Paramount products from the same era, decides to cut loose and either release these for television consumption, or push them out as DVDs on demand in the same fashion as the Warner Archive. We’re waiting. I too broke down and bought a bootleg of this movie a while ago. I really liked it too, though perhaps I can take more frequent doses of Chevalier. Being a lady helps with that, I think. I loved Chevalier and Colbert together in the Smiling Lieutenant. Though this was not up to those standards, it was really watchable. I liked the mixture of physical comedy and verbal jokes. You are so right, the classic film world has been owed decent releases of many Paramount classics. They owned Chevalier, Gary Cooper, Cary Grant, Marlene Dietrich...the list goes on. For many fans this means suffering with inferior bootlegs if we can even find that. Good film -- I saw it some years ago at Film Forum in New York. Nice blog you have, too. I cordially invite you to visit my site, "Carole & Co."